This entry-level player delivers wireless high-resolution audio in a pocket-sized package for the audiophile on the go, but it's dearth of features might be too bare bones for some. 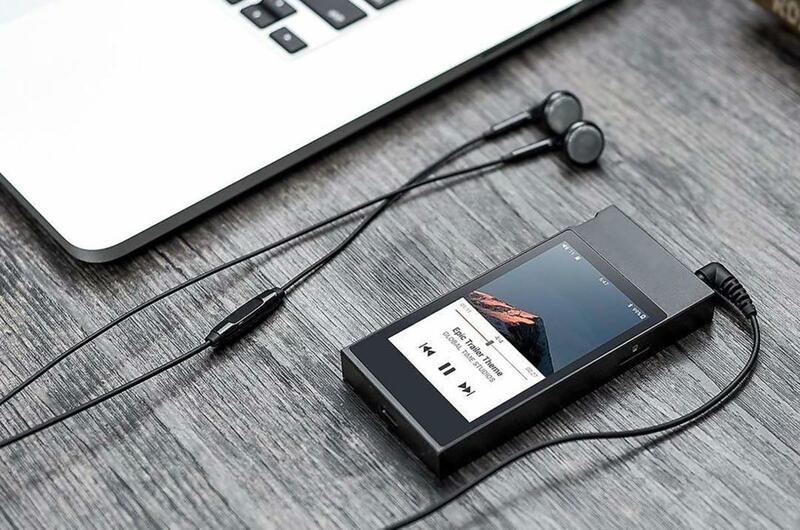 Fiio’s M7 high-res digital audio player (DAP) delivers wireless high-res music with aptX HD and LDAC support in a pocket-sized package for cash-strapped audiophiles on the go. It’s a great player as long as its modest storage capacity and dearth of features doesn’t phase you. The M7 is an elegant successor to Fiio’s M3 high-res DAP. The M7 is Fiio’s first player to use Samsung’s Exynos 7270 SoC (System on Chip), made on a 14nm FinFET process. Fiio says that compared to the older 28nm process, the two ARM Cortex A53 processors use 20 percent less power for better battery life. Storage, power management, and memory chips are part of the ARM cores. The result? The new SoC takes 40 percent less space than if the chips were packaged separately. Less space means a smaller player, better cooling, and a larger battery. The M7 sports an 1,180mAh battery rated for 20 hours of play and 40 days of standby time. 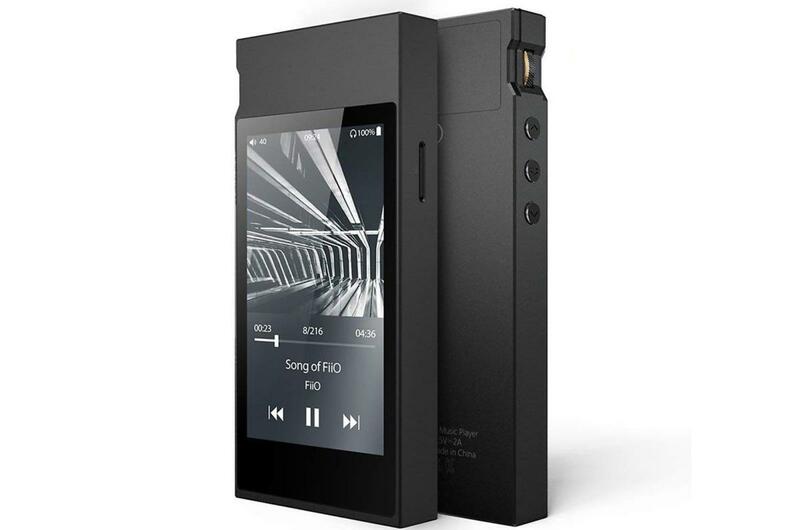 A detailed view of the Fiio M7 high-res digital audio player. Unlike the M3, which came with 8GB of storage, the M7 comes with just 2GB. Fiio says that the M7 is designed to cater to younger consumers, but Fiio must know something that I don’t. With only 2GB, you can’t store more than one or maybe two high-res albums. At 960MB, for example, Pink Floyd’s FLAC version of Wish You were Here takes up almost 50 percent of the Fiio’s storage. 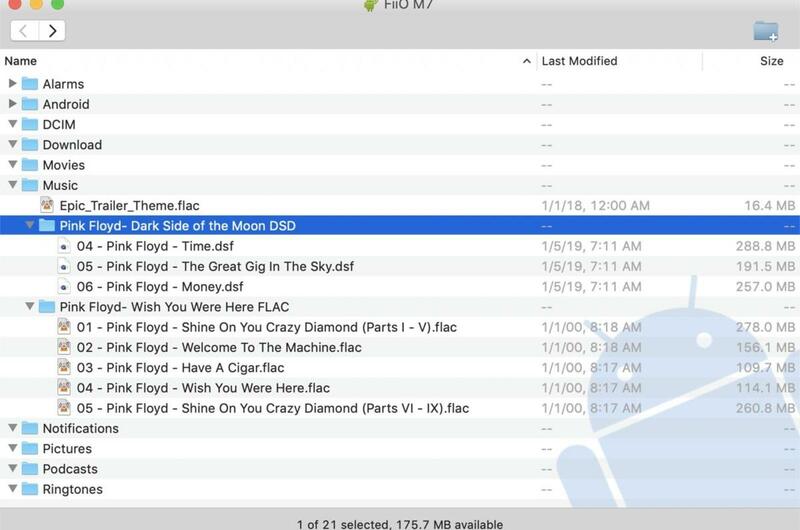 The DSD version of Dark Side of the Moon takes up just about all of it: 1.8GB. During my test period, I even felt limited with 16-bit/44.1kHz CDs. I ripped a series of Sarah McLachlan CDs as AIFF files. I could only squeeze about eight albums onto the player. Nevertheless, I give credit to Fiio for calling out this modest storage size clearly in their marketing materials. Buyers shouldn’t get a post-purchase surprise. 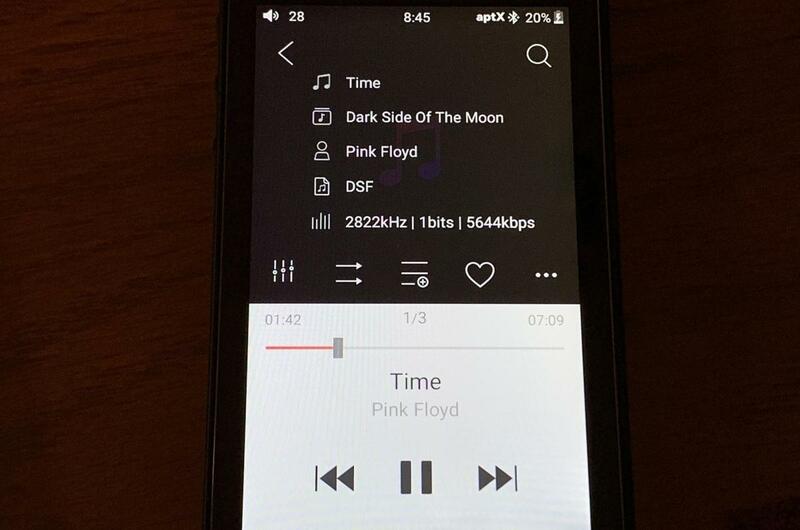 The Fiio’s internal storage wasn’t adequate to store two complete high-res albums: The DSD version of Pink Floyd’s Dark Side of the Moon and the FLAC version of Wish You Were Here. But what about those of us who own large high-res music libraries and want to take that music on the go? 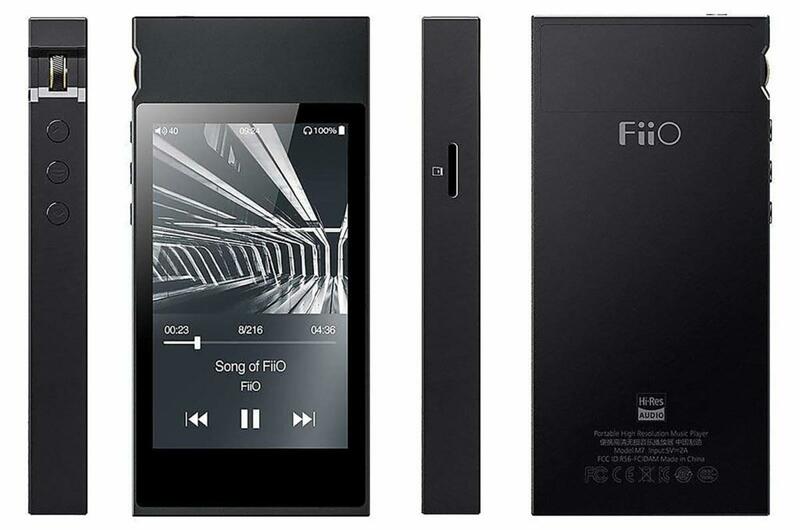 Fiio justifies the M7’s modest native storage with a microSD card expansion slot supporting cards up to 512GB. Some other high-res players only support microSD cards up to 256GB or less. Adding a 512GB microSD card, however, will set you back at least another $150 to $200. While small doesn’t work for storage, it certainly works with the Fiio’s form factor. The M7 is considerably smaller than Fiio’s X7 Mark II high-res DAP, which I reviewed last year. For comparison, it’s slightly smaller than a deck of cards. The M7’s small form factor is complemented by a 3.2-inch, 480x800-pixel touchscreen. It’s a decent size and reasonably bright. 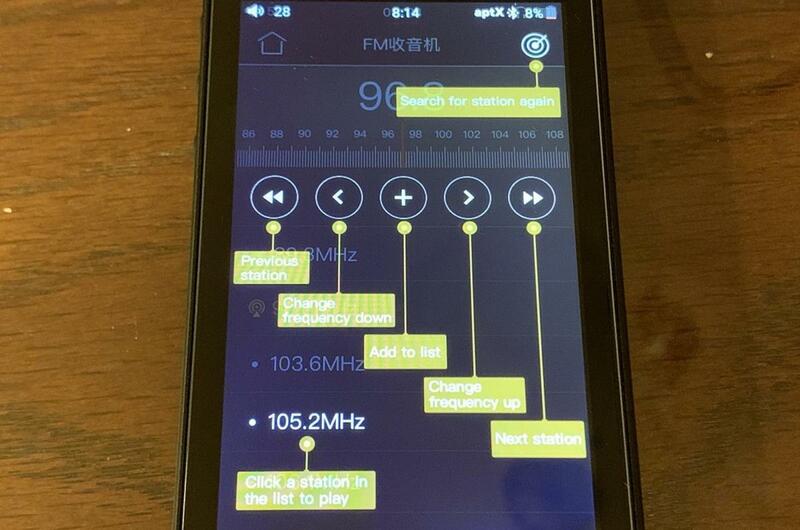 I found Fiio’s highly customized Android 7.0 operating system easy to use and navigate. 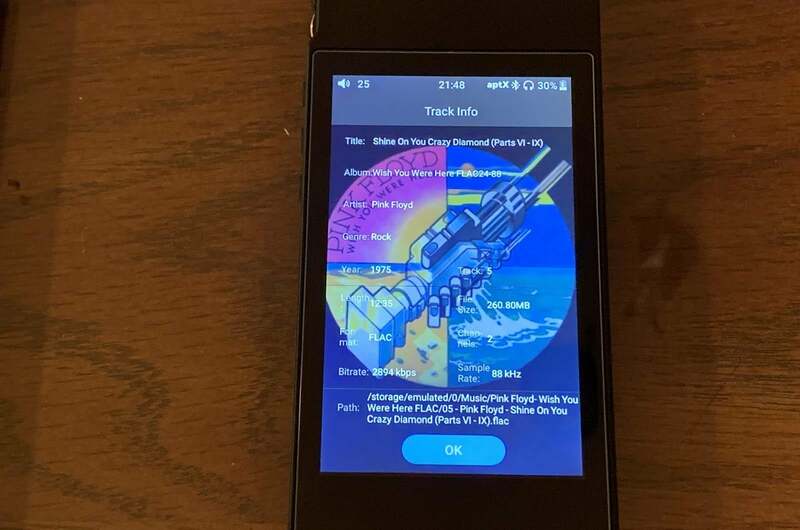 The Fiio’s interface is straightforward with a group of six colorful icons on the home screen for music, FM radio, file management, [photo] gallery, technical support, and settings. FM Radio is a cool feature, but it only works with a pair of wired headphones attached. The music app plays files from the M7’s internal storage or inserted microSD card. Unfortunately you need to scan folders or storage devices manually each time you add new music—the Fiio doesn’t do that automatically. It’s easy enough to do from the music app’s gear icon. 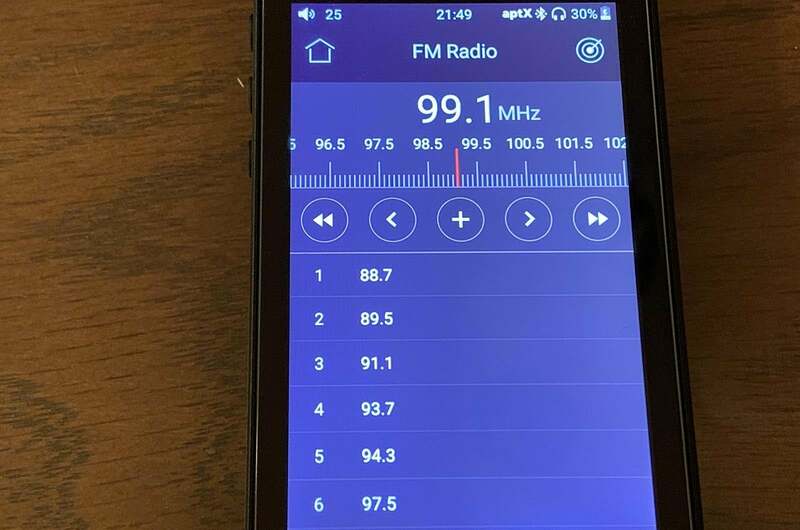 FM radio—a nice feature—requires wired headphones to work. The Fiio will scan channels automatically when you launch the app. Just make sure you have headphones plugged in before launching it. The Fiio auto-detected radio stations with a wired pair of headphones. As with the now defunct iPod nano from years ago, the player uses your headphone’s cable as an antenna to pull in an FM signal. Anecdotally speaking, with Fiio’s F9 Pro in-ear-monitor headphones I noted similar station reception as my car’s radio. Not bad! 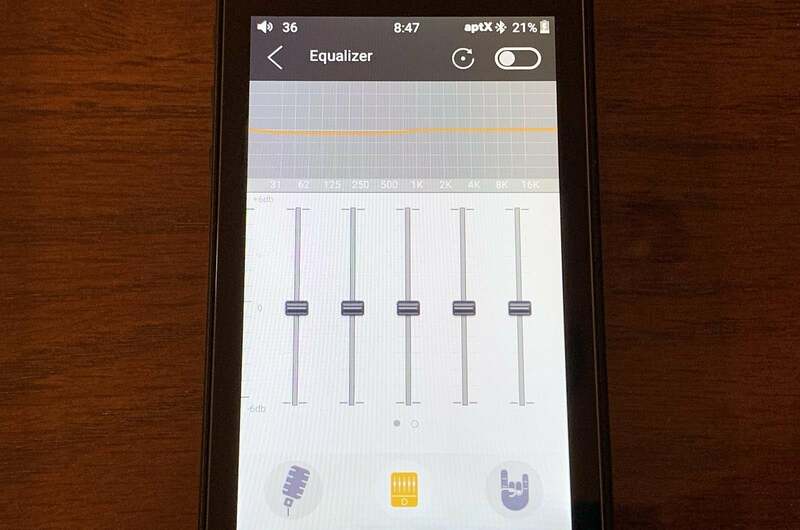 The Fiio M7 allows you to apply custom EQ filters to your music. The touchscreen responds to typical gestures, but there are a few new ones that will be easy to get used to. For example, imagine that the screen is divided into two gesture-control quadrants. Swiping up from the bottom of the left side brings you back. If you’re playing a song, for example, swiping up brings you to the album view. Swiping up on the right side brings you to the home screen. The control buttons on the player’s left side are too sensitive in my opinion. I accidentally advanced songs or went to previous tracks by touching the buttons ever so slightly. I’d like it wee more resistance in future models. The volume control sits on the unit’s upper left side, recessed into a quarter-honeycomb inlet. The volume dial is very sensitive. I guess that’s a good thing because for my taste, the dial is just too small. I found it cumbersome for right-handed use. My index finger couldn’t get good access, blocked by the back. Fiio should take a cue from Onkyo’s high-res DAP, which tapers the player’s back for right-handed access. Holding Fiio’s player in my left hand gave me a much better experience. The volume button on the left side was fine for left-handed use, but difficult to use when holding the player in my right hand. The Fiio’s volume control isn’t analog. As such, it supports headphones with inline controls—except for Apple’s headphones, that is. The headphone jack serves two purposes. You can use it with traditional headphones, but you can also set the headphone jack to function as a line-out and connect the player to a standalone sound system or powered speakers with volume control. I was disappointed to find there’s no Wi-Fi or support for streaming music services like Tidal, Spotify, or the coming-soon high-res streaming service Qobuz. I think Fiio missed a real opportunity by omitting Wi-Fi and streaming features that could have offset the small onboard memory. 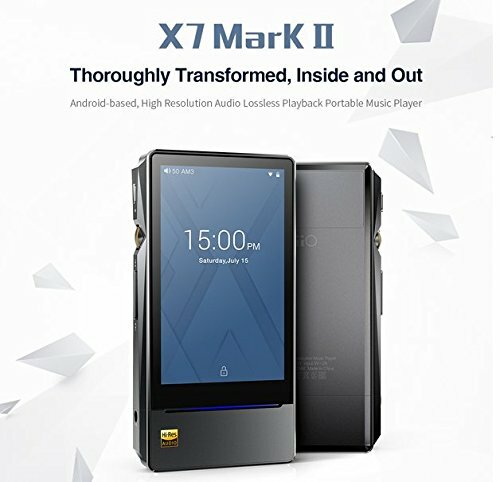 Perhaps some consumers will use the M7 as a DAC for their computer to make up for this shortcoming. 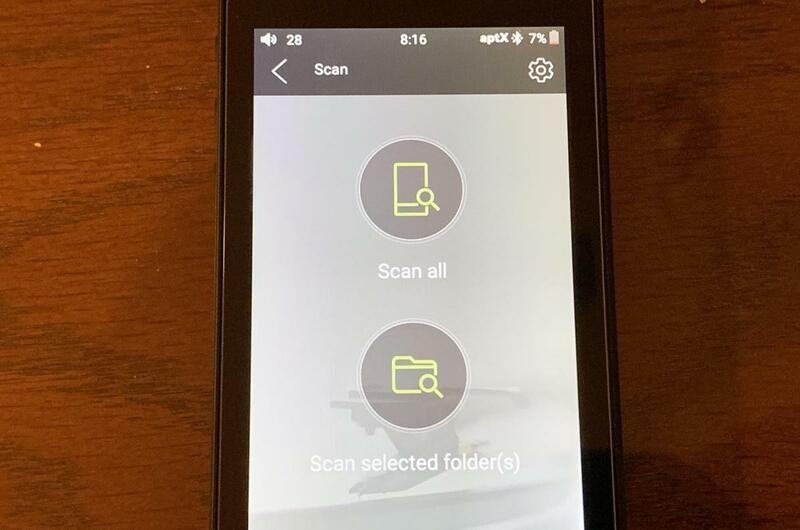 You need to scan the Fiio’s internal storage each time you add music for it to show up in the music app. Speaking of computers, Mac users will need the free Android File Transfer utility to mount the Fiio M7 in order to transfer files. Generally speaking, I’ve had positive experiences using Android File Transfer across lots of high-res DAPs, and there was nothing out of the ordinary to report during my review period. The M7 is currently available in black or silver; Fiio plans to release a blue and red color option at an as yet unannounced date. The vibrant red and blue finishes look great. I wish I could have taken one for a spin! Fiio’s players have always been known for their robust file support and flexibility. That remains with the M7—with a few caveats: You’ll find support for all the major high-res audio formats up to 24-bit/192kHz PCM, including FLAC, ALAC, APE, OGG, and WAV, to name a few. The M7 will also play DSD 128 files. And there is of course support for your favorite lossy codecs, including AAC, MP3, and WMA. The Fiio M7 can show you details about the music you’re playing. 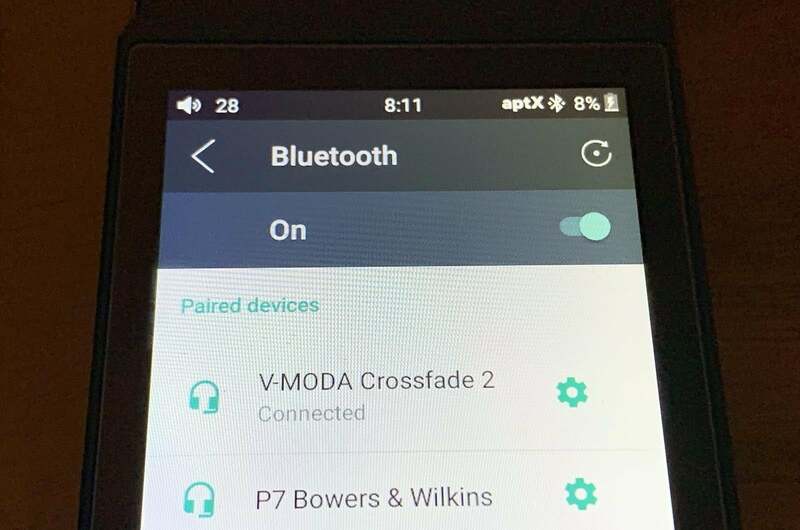 The M7’s Bluetooth codec support is outstanding and sets the M7 apart from the competition. The player supports both the aptX HD and LDAC high-res streaming codecs. AptX HD, developed by Qualcomm, will stream high-res audio up to 576Kbps at sampling rates as high as 24-bit/48kHz and is backwards compatible with aptX. Sony developed the LDAC codec, which streams high-res audio over Bluetooth at connections up to 990Kbps at sampling rates as high as 24-bits/96kHz. I had no problem pairing aptX headphones such as the V-Moda Crossfade Wireless II and the B&W P5 Wireless with the Fiio M7. As with most other Bluetooth codecs outside the Bluetooth standard, aptX HD and LDAC must be supported by both the player and the receiver. AptX HD and LDAC support in wireless headphones remains rare; though we’re seeing more and more models released each year. Perhaps most notably, Sony’s outstanding noise-cancelling headphones, the MDR-1000X M2 and M3 support both LDAC and aptX HD. I didn’t have a pair of LDAC-compatible headphones on hand to test. USB-C, or not to be? The M7 sports a USB-C connection. In the box, you’ll find a USB-A to USB-C cable. That’s a nice feature for laptops and desktops without a USB-C connector. I used the cable without issue to charge the player and to transfer data to it. One would think that if you had a computer with a USB-C port, you could just use a USB-C to USB-C cable with the M7. Alas things weren’t that simple. The moment I tried to use any other USB-C cable with the M7, it wouldn’t work. I couldn’t charge the M7, get the M7 to mount on my computer, transfer songs… anything. I tried both a Mac and Windows (Dell) laptop equipped with USB-C ports. I even tried different USB-C cables with external chargers and monitors with USB-C ports. Nothing worked. Fiio sent me out a replacement review unit, which sadly exhibited exactly the same (mis)behavior. As of press time, this issue remains unresolved. If we hear back from Fiio with more information, we’ll update this review. In the meantime, If you do purchase an M7, I suggest you guard the included USB-C cable with your life. I tested the Fiio M7 with a pair of Fiio’s own F9 Pro in-ear-monitors, Focal’s Elegia over-the-ear wired headphones, B&W’s P7 Wireless, and V-Moda's Crossfade II Wireless headphones. The B&W and V-Moda support aptX, but I was without a pair that supported either LDAC or aptX HD during my review period. In a nutshell, this is really good-sounding player. Its musical value goes way up when you consider the price. The Fiio allowed the characteristics of each headphone to come forth without overtly coloring their presentation. The M7’s presentation was very musical and involving. On the V-Moda Crossfade Wireless II played over Bluetooth with aptX, sax lines were smooth and bass lines punchy on Pink Floyd’s “Money,” from Dark Side of the Moon. I found myself tapping to the music. The Fiio can display details about your music. Through the Focal Elegia, the clock chimes on the opening of Pink Floyd’s “Time” stood firmly in space and time on a solid sound stage. Turning to “Wish You Were Here,” David Gilmour’s guitar work was reproduced in a pristine manner. The M7 did a fine job with vocals, too. Sarah McLachlan’s and Roger Waters’ vocals were spot on. All in all, the Fiio’s musical performance was thoroughly enjoyable with little to complain about. Fiio’s M7 is a perfectly-sized high-res player. Fiio’s M7 is a slick, pocket-sized digital audio player with aptX HD and LDAC high-res streaming over Bluetooth. The M7’s customized Android interface is straightforward and easy to use. There’s truly lots to like about this budget-priced player; in fact, I really wanted to fall in love with it. It sounds really good. Its form-factor? Perfect. But, this is just a basic high-res player. Depending on what your feature priorities are for this price point, I could see a half-star rating swing in either direction. But if sound quality, aptX HD, or LDAC are your top priorities, and the limited storage doesn’t turn you off, don’t think twice about giving the Fiio M7 a listen. It’s a solid high-res unit for the budget-strapped audiophile. Fiio’s M7 hi-res digital audio player (DAP) delivers wireless hi-res audio in a pocket-sized package for the audiophile on the go. But some head-scratching feature choices keep it off our Editor's Choice list.